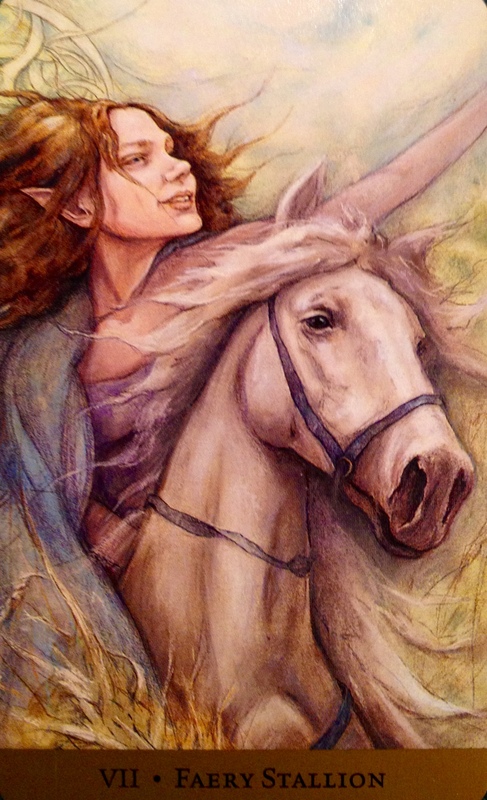 Faery Stallion: “Dark hair and white mane fly wildly in the wind as they cut together through the warm air. Over open fields and through the forest, they move smoothly as one, a perfect picture of graceful speed. Their elegant movement belies their efforts. Blood pulsing through their veins, the breath coursing in and out of their lungs fuels their movements. Muscles contract and release. She, overcome with joyful energy, reaches up as if to touch the sun, holding the silky blue reins only lightly. This card is infused with the freedom you have so long desired, are you ready to take the reins? Whatever has held you back in the past, fears, doubts or insecurities… challenges or perceived obstacles…. They have all been removed. The way ahead is clear. The future is bright and full of potential; the Light of Love is leading you on. How long has it been since you allowed yourself to fly free? To sing, to dance, to play? To move with confidence and an air of abandon? It is time to let go of fears around judgement, acceptance and approval and step courageously into being your full authentic self. And there is a very important opportunity headed your way! Should you choose to accept this mission, you will find yourself transformed in ways you never thought possible. You will realize dreams that seemed at one point mere fantasies. You will be surrounded by love and support. You will find your tribe of like-minded people. The Universe will open wide and surround you with endless possibility. All you need to do is connect with that amazing, wild, beautiful and wise Soul that is You. No more playing small. The rest will all fall into place with grace and ease. And some excitement of course!